Black Swan is a perfect movie. Intellectually provocative. Emotionally engaging. Sensual. Heart breaking. It is a movie that stays with you for a very, very long time after the credits rise. And for me, it is a movie that serves as a reminder of why I chose to become a filmmaker in the first place. To make art that tears through the barriers of social propriety and speaks truths that the heart needs to hear. From the first frame, you are swept into the dark and brooding world masterfully crafted by Darren Aronofsky, a director who is at the height of his talent. In an era of digital filmmaking and explosive special effects, Aronofsky shows us again the simple power of old-fashioned grainy film and muted lighting to pull us into another reality. One that reflects the dark shadows of our own minds, the fear that comes from looking into places within our souls that we have locked away and refused to face. Black Swan follows the journey of Nina, a ballerina played with aching honesty by Natalie Portman. Nina longs to rise to the top of her ballet company and is given the opportunity of a lifetime when the artistic director (Vincent Cassel) casts her as the lead in his new production of Swan Lake. Nina’s role requires her to master two personas – that of the White Swan, a pristine and angelic presence, as well as her nemesis, the Black Swan, a sensual temptress who steals the heart of the White Swan’s lover. The role of the virginal White Swan is easier for the repressed and emotionally controlled Nina. It is the Black Swan that presents Nina her greatest challenge – to break free of her inner walls and embrace the intense power within her. As Nina struggles with the demands of the two roles, the darkness within her own psyche is unleashed as she becomes increasingly convinced that Lily, a new dancer in the company played by Mila Kunis, is maneuvering to take her place. To be honest, I know nothing about ballet. Like many others who will see this film, I have never taken the time to appreciate the art form, dismissing it as the effete predilection of upper class snobs. Aronofsky is clearly aware of that prejudice, and the one moment he permits us to leave the closed and controlled world of the ballet company, he faces it head on. The rebellious newcomer Lily convinces a hesitant Nina to go clubbing, and the two ballerinas meet handsome young men who are rather blunt when they find out about the girls’ profession. “Sounds boring,” says one of the guys harshly. His wingman, played by Sebastian Stan who starred in my recent NBC television series Kings, is a little better at his game and manages to feign interest in ballet in the hopes of getting laid. But his face still says it all. Ballet is for uninteresting people leading uninteresting lives. As Aronofsky shows us over two hours of (literally) nail-biting tension and suspense, he is dead wrong. Black Swan is full of so many surprises that I hesitate to give more details of the film’s plot for fear of lessening its impact. But I will say that, at its heart, the movie is about the quest for perfection. Nina’s obsession with being perfect – the perfect ballerina, the perfect daughter, the perfect Swan – lead her down an increasingly dark path in which her sanity is threatened and the drums of tragedy thunder with increasing dread. It is a journey that many of us can understand. It is the terrible price of ambition. Anyone who has ever sought to better themselves knows that with each success comes a hunger for more. Each victory becomes less fulfilling, as it simply points out how many more battles must still be fought. The farther we climb up the mountain of our hopes and dreams, the more infuriatingly distant the peak becomes. We desperately seek to transcend our limitations, only to find that in our quixotic quest for an illusory perfection, we are actually rushing toward an abyss of self-hatred and self-destruction. As a Sufi mystic, I sense the sacred drive behind that madness for perfection. Sufism, the mystical heart of Islam, teaches that we were all originally one with God in a realm beyond time and space. Our souls were created and lived in a state of divine perfection, where all things were possible, where there were no limitations, just boundless potentialities. And yet our souls chose to leave that state of infinite bliss and enter into the material world, with all of its limitations, suffering and pain. Why? Because perfection was itself a lonely prison. With everything available to us, we were satiated to the point of despair. No joy of growth, no thrill of overcoming challenges, no way to taste the pleasure of victory over daunting obstacles. It was a state that my brothers in the Jewish mystical tradition of Kabbalah call the “bread of shame.” That which is earned too easily has no value. And if one is flooded with gifts without ever experiencing the dignity of earning them through hard work, the gifts become sour and ugly. When all things are available without effort, then nothing has any value. And so our souls made a fateful decision – to relinquish our inherent divine abilities to manifest instantaneously and to take form in a material world that was bounded by limitation. A cold world that is often hostile and presents dangers to our physical, emotional, and spiritual lives every day. It is a world where suffering and failure are the norm, and one must struggle every day to get by. It is the world of limitation we see around us and within us at every moment. And yet the Sufis say we chose to come to this valley of tears for a reason. Not to stagnate or wallow in our miseries. But to remember who we actually are, who we always have been – divine souls that are capable of transcending all limitations and manifesting everything our hearts desire. And that longing to rediscover the majesty of our souls, that desire to re-experience oneness with God, is what causes us to lift ourselves above the muck and grime of life and master our circumstances. The quest for perfection is at its core a quest to return to God, our source. But it is a quest that is fraught with many dangers, the greatest being delusion and obsession. Delusion in not seeing where we really are in the journey, and obsession in trying to force ourselves faster than we are ready or able to go. The quest for mastery is a journey that we each must embark on, but by definition it is the riskiest of all ventures. For in the process of seeking perfection, we are constantly reminded of how we fall short. And unless we can accept that chasm between our ideal and our reality, we can be driven into the depths of despair. In Islam, there is a belief that all souls must cross over a bridge to Paradise, a bridge that sits right over the gaping maw of the Fire. The bridge is razor thin and one’s actions in life determine whether a soul can cross the tightrope of eternity safely, or whether the soul trips and falls into the abyss. For Sufis, the lesson of this sober image is that, in seeking to return to Heaven, we must risk falling into Hell. That dangerous journey into the heart of perfection is the journey of Black Swan. And it is a journey that is perfectly (if I may use that word) embodied by the remarkable Natalie Portman. Portman brings Nina to life with heart-wrenching authenticity. Her hopes, dreams, foibles, and insecurities are our own. And her terrifying descent into her personal hell makes us face our own inner demons with brutal honesty. There is a widespread belief that Portman will win the Academy Award for best actress for this role. If so, it may be because in this film we finally get a chance to see who she really is on many levels she has hidden from us before. As I watched the film, I was struck with a strange sensation that this movie was perfectly cast, because I suspect that Portman understands Nina’s painful quest for perfection far more than she has ever been willing to share with the world. To the public, Natalie Portman lives a charmed life. A movie star since she debuted at the age of 13 in The Professional, Portman went on to graduate from Harvard. Unlike other child stars, she managed to maintain a dignified and private life, excelling in school even as she became part of history’s most valuable film franchise Star Wars, playing the doomed wife of Darth Vader. Portman earned her first Oscar nomination for Closer before she turned 25. And she has dedicated herself to humanitarian causes, including supporting micro-financing opportunities for women in poor countries. Publicly, Portman has the persona of a saint. The image of the perfect girl that can do no wrong. And yet I have never believed that public persona represented her deeper truth. The challenges of being thrust into the limelight at such a tender age must have weighed deeply on Portman. The added pressure of being held up by the public as an icon of perfection, of not being allowed to be flawed and human like everyone else, is unimaginable. It is a tribute to her inner strength that she has maintained her dignity in a world that sets up idols on a pedestal and then gleefully waits for them to destroy themselves. And yet I have no doubt that there are moments when this talented young woman has wanted to break free of the expectations around her, to free herself from the myth of “Natalie Portman” and write her own destiny as a real, living human being, warts and all. I believe that inner struggle is what we are privileged to watch in Black Swan. The struggle of a young woman facing the demons of perfection, of confronting the expectations of her family, peers and mentors. In my experience in Hollywood, I have found that many actors use their craft as a means of hiding who they really are from the world as well as from themselves. In taking on this role, Natalie Portman has done the most intimate and risky thing for an actor – revealing naked truths that may very well reflect the deepest core of her own being. Black Swan is a tragedy because it reveals the tragedy of the human condition. The tragedy of longing to return to a home that we ran away from and that is now always just one step ahead of us, like the end of a rainbow. We are children of the Sun, and like Icarus, we long to fly back to our origins. But the melting wings of human frailty bring us always crashing back to earth. So if perfection is not possible, attainable, or even desirable, what is the purpose of our lives? To answer that, like any good Sufi, I will share a story. An American woman who embraced Sufism went on a journey to the Muslim world to find a shaykh, a mystical teacher who could guide her on her spiritual path. She told the shaykh that she sought the perfection that came from unity with God. The shaykh nodded and told her that her first step on the journey would come once she mastered a simple earthly task, such as grooming a horse. He took her to the stable and gave her a brush. The woman diligently spent hours carefully brushing the mane and coat of the shaykh’s favorite horse. At the end of the day, the shaykh returned and she showed him her work. He frowned and pointed out how many tiny hairs were still out place. Looking closer, the woman realized he was right. She vowed to do better the next day. After spending many more hours carefully and lovingly caressing the horse with the brush, she showed the shaykh her work. He shook his head, frustrated. Yet again he pointed out tiny flaws in the horse’s coat. She really needed to do better. This went on day after day, and the woman began to despair. Every day she showed the shaykh her work, and every day he found it imperfect. After several months, when the shaykh yet again dismissed her brushing as inadequate, the woman exploded in fury. The shaykh turned to her with a smile, his eyes twinkling. Thank you Darren Aronofsky for gifting the world with your remarkable film Black Swan. And thank you, Natalie Portman, for the courage to show us the truth in your performance. Perfection is an illusion. Ron Howard’s new adaptation of the Dan Brown book Angels and Demons represents a breakthrough in Hollywood’s approach toward religion, taking the discussions of faith away from the extremes of proselytizing and rejection to the middle ground. That is where most believers are, and that is where great storytelling takes place. And Angels and Demons is great storytelling. As a practicing Muslim working inside Hollywood, I have often felt that there is a tangible bias in the entertainment industry, not just against my own religion, but against people of faith in general. Too often, I have seen important film and television projects that look at religious faith in a sophisticated way disappear into a black hole within the system. The excuse used by many traditional Hollywood types, that religion is just too controversial a matter to deal with in cinema, has always rung false. Indeed, the great moguls who founded Hollywood knew that the majority of their audience consisted of devout believers, and being smart businessmen, they catered to religious ticket buyers with majestic films like The Robe and The Ten Commandments. Indeed, it is the latter film, Cecile B. DeMille’s epic on Moses, which has exerted profound personal influence on me both as a believer and as a filmmaker. The Ten Commandments was the first movie I ever saw after I emigrated from Pakistan to the United States at the age of three. Watching that film on our newly acquired television set in our tiny apartment in Queens, I was taken away to a magical dimension. A world where God spoke to men through a burning bush and a pillar of fire, where a shepherd’s staff could transform into a snake and the Nile could turn red with blood, a world where an evil Pharaoh could be humbled by a simple prophet emerging from the desert. I remembered turning to my father as the end credits rolled, my heart pounding with wonder, and asking him a question that would begin my personal journey of faith. Over the years, I have heard many answers to that question, but none that has yet to satisfy me more than the one my father gave me that night after we watched the movie. His perspective has stayed with me over the years, and has allowed me to approach both my craft as a filmmaker and novelist, as well as my social interactions as a human being, with a sense of humility. The Ten Commandments taught me that God is everywhere, and His voice can be heard at any time, from any source. Whether it is through a bush burning in the desert, or from the mouth of someone from another culture, even another religion, God’s voice is always echoing around us, if we only choose to hear. Yet faith, as any true believer will admit, is hard. We are imperfect people living in a broken world trying to make sense of it all, and it is often hard to reconcile what our hearts tell us about the spiritual beauty of God and what our senses tell us about the evils and suffering of creation. Faith at its best is our shelter during the storms of life, our sturdy ship to guide us through the turbulent seas of the human experience. But at its worst, it can be used as a tool to control and oppress others, to spread suffering instead of love in this world. Any believer who is sincere must confront daily the contradictions that come with belief and somehow synthesize these opposing realities in a way that makes sense to the heart, even if it cannot be grasped by reason. To trust that there is purpose and meaning in this cosmos, despite the onslaught of evidence to the contrary. Maybe that is why it is called “faith” in the first place. Angels and Demons is the first Hollywood movie in a long time that really looks at what it means to be a believer, and the extremes that can be found among people who look to faith for guidance. Without revealing the film’s secrets, I think it is safe to say that it is a movie that examines whether science and religion are incompatible, and explores the dark actions that people take when they conclude that one of these disciplines threatens the other. While some conservative Catholics might find the film’s portrayal of the secret dealings inside the Vatican offensive, I think most people, Christian or otherwise, will appreciate its very human picture of characters who are motivated by faith and committed to struggling with “demons,” both in others and within themselves. It is this presentation of raw, imperfect human beings struggling with faith that I appreciated most, as I face these battles within myself every day as a believer. Indeed, when I wrote my novel, Mother of the Believers, I found myself naturally examining these conflicts in the context of the birth of Islam. My book, which follows the rise of Islam from the perspective of Aisha, Prophet Muhammad’s wife, portrays the early Muslim community as consisting of very complex, passionate and, at times, flawed individuals. People who most overcome their own inner demons to do good, and when they sometimes fail, who repent and return to the “straight path,” as sincere faith is called in the Qur’an. What I hope my novel accomplished, and what I know Angels and Demons did, is to take the discussion of religion out of the hands of extremists with an agenda. That agenda could be the desire to proselytize others and convince them of the truth of a religion, or to go to other extreme, which is to mock believers as simpletons who couple faith in God with a conviction that the earth is flat and that babies come from storks. To my sorrow, many of my colleagues in Hollywood share the latter agenda. People of faith have complained for years, with real justification, that Hollywood promotes an anti-religion outlook. Bill Maher’s recent documentary Religulous went out of its way to find the wackiest, craziest believers in the world and then mock them. And Hollywood studios continue to resist making movies that would appeal to believers. Long before there was any controversy over Mel Gibson’s beliefs, his idea about doing a film on the Crucifixion in Aramaic was mocked by studio executives, who could not understand why such a film might appeal to millions of Christians. While one can certainly take Mr. Gibson to task for some of his words and actions, the movie is a powerful and compelling work of cinema that even a non-Christian like myself can appreciate. At its core, it is a film about the central Christian story of the Messiah’s tragic sacrifice for mankind. How could that not be a blockbuster? And yet many people I knew in the industry flew into an outraged frenzy when The Passion of the Christ became a huge global hit. It was as if the demonstrated power of traditional religious audiences was a personal insult to the worldview of many Hollywood players, who, in my experience, usually worship only one god – money. This prejudice against faith inside Hollywood makes Angels and Demons an even greater accomplishment. Ron Howard’s movie is important not only because it treats religious faith with respect, but because it actually explores the central issue that is important to many believers today – how to reconcile ancient religious beliefs with the modern discoveries of science. Contrary to the prejudices of anti-religion writers like Sam Harris and Richard Dawkins, the majority of faithful people are not living in a delusional world, their eyes and ears closed to science and discovery. InAngels and Demons, one of the most important scientists involved in cutting edge physics research happens to be a Catholic priest. For that character, the quest to understand the fabric of the universe through the lens of quantum science is very much a religious quest to pierce the veil and see at last the Face of God. As several characters in the film point out, religion and science are methodologies to come to understand the truth of the cosmos. They do not need to be antithetical to each other. In fact, they can and should be complementary human endeavors to understand this remarkable universe in which we find ourselves. And this is by no means a radical new perspective among believers. As the film points out, Galileo saw himself as a devout man seeking to understand God’s creation. Isaac Newton also found no contradiction between faith and science and believed the existence of God was self-evident. It was simply his role as a scientist to better understand the work of the Creator. God was the cosmic clockmaker and scientists were merely examining the delicate inner workings of His design. And in the modern world, with the strange and inexplicable discoveries of quantum physics, scientific treatises on the nature of reality sound remarkably like ancient mystical writings. The more we learn about the shocking contradictions and improbable mechanics of the subatomic world, the more it appears that the universe is less like Newton’s giant clock and more like one giant dream, imagined from within an implicate order that transcends human reason. Such a vision would be familiar to the Sufis of Islam, along with their counterparts among Buddhist masters, Kabbalists and Christian mystics like Meister Eckhart. And it is not only the scientists that are beginning to realize that something truly magical serves as the foundation of reality. Believers are beginning to see in the wondrous scientific order of the universe the evidence of the Divine in action. In The Language of God: A Scientist Presents Evidence for Belief, Francis S. Collins explains why the discoveries of modern science only confirmed his personal faith as a Christian. Mr. Collins is no backwoods preacher – he is a pioneering medical geneticist who once led the Human Genome Project. A similar effort to unite faith and science has long been under way in my own faith, Islam. In my novel, I discuss how Islam was founded on a hunger for knowledge. Prophet Muhammad said: “Seek knowledge, even if you must go to China.” And his words inspired Muslims to become the world’s greatest scientists at a time when Europe was mired in the Dark Ages. In Lost History: The Enduring Legacy of Muslim Scientists, Thinkers and Artists, Michael Hamilton Morgan demonstrates how Muslim scientists in the Middle Ages made incredible advances in every field of study, from astronomy to medicine to mathematics. In the modern world, there has been a popular effort among Muslim writers to present Islam’s scripture, the Qur’an, as completely compatible with the discoveries of modern science. A bestselling book in the Muslim world, The Bible, The Qur’an, and Science, by a French physician Maurice Bucaille, argues that the Qur’anic verses describing everything from the expansion of the universe to the intricate details of embryonic growth inside the womb are in absolute alignment with modern scientific theories. Of course, non-believers will be skeptical of such claims, but the point is not whether Mr. Bucaille’s reading of the Qur’an is correct. What matters is that his theories are now commonplace among Muslims, so that believers do not find modern scientific discoveries to be in any way threatening to their faith. In fact, because of this widespread interpretation of the Qur’an, many Muslims find confirmation of their faith through the discoveries of modern science. The painful Christian debate over the primacy of faith versus science that is portrayed in Angels and Demons is simply not happening in the Muslim world, as there is already a consensus that there can never be any contradiction between the two. But even if one is unconvinced that any ancient scripture can remain unchallenged by the discoveries of modern science, it is important to note that the purpose of scripture is not, in fact, to serve as a scientific textbook. The purpose of any holy text that has survived the centuries is to provide moral and ethical guidance to human beings. That is true of the Bible, the Qur’an, the Bhagavad Gita and the Buddhist Sutras. These texts are meant to help us as human beings live in this world and make sense of our lives. They survive because they work. A Christian friend of mine once asked how I reconciled the story of Adam and Eve in the Qur’an with the scientific consensus on evolution. I smiled and said to him that I didn’t bother. It’s like comparing apples and musical notes. The scientific theory and the scriptural story serve totally different purposes. Science is about how. Religion is about why. Scientists examine the fossil record and come to an understanding of what it means for the history of life on our planet. But the scriptural story of creation is not about history – it is about values. As a believer, the story of Adam and Eve teaches me everything I need to know about what it means to be human. We are all children of Adam, whose name simply means “dust” in Hebrew and Arabic. We are children of this earth. Human beings are brothers and sisters, all part of one family. Like our archetypal father figure, we can make mistakes, we can sin, and we can also repent and find forgiveness. That is the lesson of the story in both the Bible and the Qur’an. Whether it describes a historical event is absolutely pointless and irrelevant. Science can tell me how I got here as a human being, but it cannot tell me what I am supposed to do now. Indeed science without a spiritual connection can be used to create great evil, as the Nazis proved with their eugenics experiments. The Nazis believed in the methodology of science, but they did not believe in the simple lesson derived from faith – that human life is sacred. The ancient stories and rituals of our religions are meant to help us learn profound spiritual truths that cannot be deduced by examining cells under a microscope. It is that power of wise storytelling that is religion’s purpose and gift to humanity. Cecil B. DeMille understood that. He knew that the power of the Bible lay in its stories, and he turned those stories into incredibly moving, epic films. These ancient tales about good versus evil, the power of love and forgiveness, and the triumph of the weak over the proud, are timeless and have meaning for every generation. It is a kind of storytelling that Hollywood has sadly forgotten. But perhaps with Angels and Demons, Hollywood can start moving away from the extremes of materialism and cynicism toward the spiritual center where the audience eagerly awaits. And then maybe we filmmakers might be able to play a more profound role as storytellers that help human beings make sense of this truly majestic cosmos. 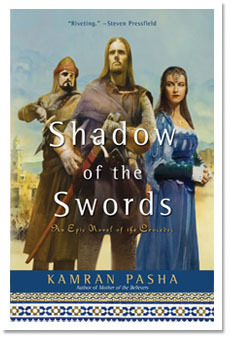 An epic saga of love and war, Shadow of the Swords tells the story of the Crusades-from the Muslim perspective.